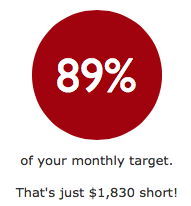 A gauge with segments: Users like this as it's immediately visible how well they are doing this month vs the target. However some feel that the target marker is somewhat hidden, and if they do extra well (go over 150%, which happens regularly) there's no change. A bar chart: The users that don't like the gauge prefer this, as the "Sales" can keep on increasing. However this is difficult to break into the segments. So what would be a good compromise between these two? It needs to be visual, and fit into a smallish space - 300px square on an email. The gauge I have been using is like this (each segment represents 25%, the blue line is 100% or target). First thing first: there's not a "best graph for sales" thing. There are graphs that are more suitable for certain scenarios and user cases, which can be really different. I think the gauge is a bit confusing and in terms of data visualization that is a big no-no. In general, if you want to use charts for sales, you will want to do something simple, clear and where all required data is available at first sight. I think that a bullet chart or graph would fit the criteria of what you are looking for quite well. As you can see, it is a very concise way to encode a number of information, and also lets you easily make comparisons with other data sets. I think there is a misconception that gauges are easy for people to interpret - they are familiar and will attract attention if they are colourful enough (as your design seems to be), but when it comes to the practical aspects of displaying data effectively I can you can also attest to its shortfalls. But there are use cases for it as well so don't discount it entirely.